Buster Keaton (born Joseph Frank Keaton, October 4, 1895 – February 1, 1966) was an American silent film comic actor and filmmaker. His trademark was physical comedy with a stoic, deadpan expression on his face, earning him the nickname "The Great Stone Face" (referencing the Nathaniel Hawthorne story about the "Old Man of the Mountain"). His career as a performer and director is widely regarded to be among the most innovative and important work in the history of cinema. He was recognized as the seventh greatest director of all time by Entertainment Weekly. In his highly influential and groundbreaking book, The American Cinema: Directors and Directions, 1929-1968, leading film critic Andrew Sarris included Keaton in his Pantheon of American film directors. Buster Keaton was born into the world of vaudeville. His father was Joseph Hallie Keaton, a native of Vigo County, Indiana, known in the show business world as Joe Keaton. Joe Keaton owned a traveling show with Harry Houdini called the Mohawk Indian Medicine Company, which performed on stage and sold patent medicine on the side. Joseph Frank Keaton was born on October 4, 1895 in Piqua, Kansas, the small town where his mother, Myra Edith Cutler, happened to go into labor. The name "Buster" was acquired in his youth. Popular legend has it that one day before a vaudeville performance, a very young Keaton was walking down a flight of stairs, but tripped and fell down the entire flight and broke his nose. Keaton got right back up, and upon seeing this the famous magician Harry Houdini, who was in the performance, said to Keaton's mother that he was "quite the little buster." Although Houdini did tour with the Keatons, he did not join up with them until Buster Keaton was well beyond infancy. It is more likely that the nickname was given by a fellow vaudevillian whose name has been lost to history. At the age of three, he began performing with his parents in The Three Keatons; the storyline of the act concerned how to raise a small child. Myra played the saxophone on one side while Joe and Buster performed on center stage. The young Keaton would goad his father by disobeying him, and the elder Keaton would respond by throwing him against the scenery, into the orchestra pit, or even into the audience. A suitcase handle was even sewn into Keaton's clothing to aid with the constant tossing. The act evolved as Keaton learned to take trick falls safely. He was rarely injured or bruised on stage. Nevertheless, this knockabout style of comedy led to accusations of child abuse. Decades later, Keaton said that he was never abused by his father and that the falls and physical comedy were a matter of proper technical execution. In fact, Keaton would have so much fun, he would begin laughing as his father threw him across the stage. This drew fewer laughs from the audience, so he adopted his famous deadpan expression whenever he was working. The act ran up against laws banning child performers in vaudeville. When one official saw Keaton in full costume and makeup, he asked a stagehand how old that performer was. The stagehand shrugged and pointed to the boy's mother, saying "I don't know, ask his wife!" Despite tangles with the law and a disastrous tour of English music halls, Keaton was a rising star in the theater, so much so that even when his parents tried to introduce the other children into the act, he remained the central attraction. By the time Keaton was 21, his father's alcoholism threatened the reputation of the family act, so he and his mother left Joe in Los Angeles. Keaton traveled to New York, where his performing career moved from vaudeville to film. Although he did not see active combat, he served in World War I, during which time he lost some of his hearing. In 1921, he married Natalie Talmadge, sister-in-law of his boss, Joseph Schenck, and sister of actresses Norma Talmadge and Constance Talmadge. During the first three years of the marriage, the couple had two sons, James (1922-2007) and Robert (1924-), but after the birth of Robert, the relationship began to suffer. According to Keaton in his autobiography, Natalie turned him out of their bedroom and sent detectives to follow him to see who he was dating behind her back. She also spent enormous sums of money. During the early 1920s, as per his autobiography, he dated actress Kathleen Key, and upon ending the affair, Key flew into a rage, tearing up his dressing room. Not until 1932, did Natalie bitterly divorce Keaton, at which time the court awarded her custody of both sons and substantial financial support. She refused to allow any contact between Keaton and his sons, whose last name she had changed to Talmadge. Keaton was reunited with them about eight years later when the older son turned 18. The failure of his marriage, along with the loss of his independence as a filmmaker, led Keaton into a period of serious alcoholism. In 1933, Keaton married his nurse Mae Scriven during an alcoholic binge about which he afterward claimed to remember nothing (Keaton himself later called that period an "alcoholic blackout"). Scriven herself would later claim that she didn't even know Keaton's real first name until after the marriage. When they divorced in 1936, the court awarded her half of everything they owned. In 1940, Keaton married Eleanor Norris, who was 23 years his junior. She saved his life from his spiral of alcoholism and helped to salvage his career. All of their friends advised them against marrying, but the marriage lasted until his death. Between 1947 and 1954, they appeared regularly in the Cirque Medrano in Paris, in a highly-regarded double act. She came to know his routines so well that she often participated in them on TV revivals. She outlived him by 32 years, dying in 1998. Keaton died of lung cancer on February 1, 1966, at the age of 70. Although he was diagnosed with the disease, he was never told that he was terminally ill. In a documentary on his career, his wife told Thames Television that Keaton played cards with friends the night before he died. After Keaton's successful work with Arbuckle, Schenck gave him his own production unit, Buster Keaton Studios. He made a series of two-reel comedies, including One Week (1920), Cops (1922), The Electric House (1922), and The Playhouse (1921). Based on the success of these shorts, Keaton moved to full-length features. His most enduring feature-length films include Our Hospitality (1923), The Navigator (1924), Sherlock Jr. (1924), The Cameraman (1928), Steamboat Bill Jr. (1928), and The General (1927). This last film, set during the American Civil War, is considered his masterpiece, combining physical comedy with Keaton's love for trains. Many of his most well-known films performed poorly at the box office at the time. Years later, rival director Leo McCarey talked about the freewheeling days of making slapstick comedies: "All of us tried to steal each other's gagmen. But we had no luck with Keaton, because he thought up his best gags himself and we couldn't steal him!" Keaton also habitually performed his own stunts, sometimes at great physical risk; during the railroad watertank scene in Sherlock Jr., Keaton broke his neck and did not realize it until years afterwards. In addition, the technical side of filmmaking fascinated him and he was forward thinking enough that, when they began to become technically practical and popular, he wanted to direct sound films. The fact that he had a good voice and years of stage experience promised an easier adjustment than Charlie Chaplin's silent Tramp character, who could not survive sound. Keaton's loss of independence as a filmmaker coincided with the coming of sound films and mounting personal problems, and his full potential in the early sound era was never realized. Keaton signed with Metro-Goldwyn-Mayer (MGM) in 1928, a business decision that he would later call the worst of his life. He realized too late that the studio system MGM represented would prove to be a far more restrictive atmosphere than the freedom he had known previously, severely limiting his prior creative independence. From then on he would (for the first time) be forced to use a stunt double during some of his more dangerous scenes, as MGM wanted badly to protect its investment. He also stopped directing, but continued to perform and made some of his most financially successful films for the studio. MGM tried teaming the laconic Keaton with the rambunctious Jimmy Durante in a series of movies including The Passionate Plumber, Speak Easily, and What! No Beer? Although the two comedians never quite meshed as a team, the films proved popular. What! No Beer? was Keaton's last starring feature in America. Behind the scenes, Keaton's world was in chaos, with divorce proceedings contributing to his alcoholism, which in turn caused production delays and unpleasant incidents at the studio. Keaton was so depleted during the filming of What! No Beer? that MGM released him from his contract, despite the film's resounding success. In 1934 Keaton accepted an offer to make an independent film in Paris, Le Roi des Champs-Élysées. During this period he made one other film in Europe, The Invader (released in America as An Old Spanish Custom in 1936). Upon his return to Hollywood, he made a screen comeback in a series of 16 two-reel comedies for Educational Pictures. Most of these are simple visual comedies, with many of the gags supplied by Keaton himself. The high point in the Educational series is Grand Slam Opera, featuring Buster in his own screenplay as an amateur-hour contestant. When the series lapsed in 1937, Keaton returned to MGM as a gag writer, particularly for Red Skelton and the Marx Brothers–including At the Circus (1939), and Go West (1940). In 1939, Columbia Pictures hired Keaton to star in two-reel comedies; the series ran for two years. The director was usually Jules White, whose emphasis on slapstick made most of these films resemble White's Three Stooges comedies. Keaton's personal favorite of the ten Columbia films was directed not by White but by Mack Sennett veteran Del Lord: Pest from the West (1939), a two-reel remake of Keaton's feature The Invader. Moviegoers and exhibitors welcomed Keaton's Columbia comedies, which were successful enough to be re-released again and again through the 1960s. Keaton's personal life had stabilized with his 1940 marriage, and now he was taking life a little easier, abandoning Columbia for the less strenuous field of feature films. Throughout the 1940s Keaton played character roles in both "A" features and "B" films. Critics rediscovered Keaton in 1949 and producers hired him for bigger pictures. He guest-starred in such films as Sunset Boulevard (1950), Around the World in 80 Days (1956), It's a Mad, Mad, Mad, Mad World (1963), and A Funny Thing Happened on the Way to the Forum (1966). He appeared in Chaplin's Limelight (1952), recalling the vaudeville of The Playhouse. Limelight was the only time in which the two giants of silent comedy would appear together on film. Keaton had a successful series on Los Angeles television, The Buster Keaton Show (1950). An attempt to recreate the first series on film as Life with Buster Keaton (1951), which allowed it to be broadcast nationwide, was less well-received, although veteran actress Marcia Mae Jones and gagman Clyde Bruckman made contributions. A theatrical feature film, The Misadventures of Buster Keaton, was fashioned from the series. Keaton said he canceled the filmed series himself because he was unable to create enough fresh material to produce a new show each week. Keaton also appeared on Ed Wynn's variety show. At the age of 55, he successfully recreated one of the stunts of his youth, in which he propped one foot onto a table, then swung the second foot up next to it, and held the awkward position in midair for a moment before crashing to the stage floor. I've Got a Secret host Garry Moore recalled, "I asked (Keaton) how he did all those falls, and he said, 'I'll show you'. He opened his jacket and he was all bruised. So that's how he did it - it hurt - but you had to care enough not to care." At the age of 70, Keaton suggested a piece of physical comedy for his appearance in the 1965 movie Sergeant Deadhead, in which he ran past the end of a firehose into a six-foot-high flip and crash. When director Norman Taurog balked, expressing concerns for Keaton's health, Keaton said, "I won't hurt myself, Norm, I've done it for years!" Keaton's silent films saw a revival in the 1950s and 1960s. In 1961 he starred in The Twilight Zone episode "Once Upon a Time," which included both silent and sound sequences. Keaton also found steady work as an actor in TV commercials, including a popular series of silent ads for Simon Pure Beer in which he revisited some of his favorite sight gags from his silent film days. Keaton starred in a short film called The Railrodder [sic] (1965) [for the National Film Board of Canada. Wearing his traditional porkpie hat, he traveled from one end of Canada to the other on a motorized handcar, performing gags similar to those in films he made 50 years before. The film is also notable as Keaton's last silent screen performance. 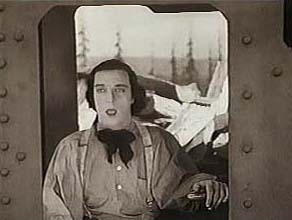 The Railrodder was made in tandem with a behind-the-scenes documentary about Keaton's life and times, called Buster Keaton Rides Again–also made for the National Film Board. He played the central role in Samuel Beckett's Film (1965), directed by Alan Schneider. Keaton's last film appearance was in the musical farce A Funny Thing Happened on the Way to the Forum (1966). Buster Keaton, Charlie Chaplin and, to a lesser extent, Harold Lloyd are remembered as the greatest comic innovators of the silent film era. It should be noted that Chaplin's films have always been more accessible than those of Keaton in both senses of that term: emotionally and artistically accessible to nearly everyone, as well as more widely available. Keaton's films have been more difficult to find and view than those of Chaplin. Many of them did not make much money at the box office, and many were lost for years until they were found again and restored in the 1960s. Although Chaplin has always been better known and his films more often seen, there are critics and commentators—the great Spanish director Luis Buñuel for one—who have preferred the work of Keaton to that of Chaplin. In the one scene in which they ever appeared together in any film, in Chaplin's Limelight, Keaton succeeded in stealing the scene from Chaplin. Although both were giants of silent film, there is a distinct difference in the tone and content of the films of Keaton and Chaplin. Chaplin's films dealt primarily with human relations: The Tramp as a character found and created comedic situations as an interactor with and a foil for the foibles of other humans. Chaplin's comedy was primarily a comedy of human interactions, and the films are frequently sentimental. Chaplin was the Tramp, an easily understood human clown. Keaton was a stoic dealing with an absurd universe. Keaton's comedy was that of a human, mostly alone, dealing with an absurd universe made up of recalcitrant and even perverse nature and machines. He produced an existential comedy of a human being dealing, in his stoic and stone-faced way, with the vagaries of wind, rain, water, and human artifacts—machines, boats, trains—that usually seem to conspire against him, but that he ultimately survives and overcomes, sometimes through Rube Goldberg-like constructions. Keaton's was a strongly physical-based comedy in which he did his own stunts. In a famous shot from Steamboat Bill Jr., for example, Keaton stands in a field next to a building. The entire wall of the building is blown down and collapses over him but Keaton is unscathed because he is standing in the exact spot where the single window of that wall of the building goes around him. Had Keaton missed that spot by just an inch or so, he would likely have been crushed by the falling wall, so exact planning as well as total faith in and commitment to the calculations of where he needed to stand to get the shot were necessary. Keaton's career as a performer and director is widely regarded to be among the most innovative and important work in the history of cinema. He was recognized as the seventh greatest director of all time by Entertainment Weekly and ranked twentieth in MovieMaker Magazine's 2002 ranking of the 25 Most Influential Directors of All Time. Keaton has two stars on the Hollywood Walk of Fame: 6619 Hollywood Boulevard (for motion pictures); and 6321 Hollywood Boulevard (for television). In 1994, his image appeared on a United States postage stamp designed by caricaturist Al Hirschfeld. A 1957 bio-pic The Buster Keaton Story, starring Donald O'Connor as Keaton, was based on his life but contained many errors of fact and merged his three wives into one character. The 1987 documentary Buster Keaton: A Hard Act to Follow, which won two Emmy Awards, is considered a much more accurate telling of Keaton’s story. During the height of his popularity, Keaton spent $300,000 to build a 10,000-square-foot home in Beverly Hills. Later owners of the property were actors James Mason and Cary Grant. The "Italian Villa," as Keaton called it, can also be seen in the movie The Godfather. Keaton later said "I took a lot of pratfalls to build that dump." In the first Keaton pictures with sound, he and his fellow actors would shoot each scene three times: one in English, one in Spanish, and one in either French or German. This was done before dubbing became commonplace. The actors would memorize the foreign-language scripts a few lines at time and shoot immediately after. This is discussed in the AMC documentary Buster Keaton - So Funny it Hurt, with Keaton complaining about having to shoot lousy movies not just once, but three times. His stage name in Spanish markets was Pamplinas ("Nonsense"), and his nickname became Cara de palo ("Wooden face"). ↑ "Biography, Buster Keaton" (Information taken from "Buster, A Legend In Laughter," by Larry Edwards.) imdb. Retrieved April 16, 2008. ↑ Buster Keaton, 70, Dies on Coast; Poker-Faced Comedian of Films"On this Day" Associated Press, New York Times. Retrieved April 16, 2008. ↑ Edwards says Arbuckle and Keaton met at Talmadge; the IMDB says "Butcher Boy" was made at Colony Studios in NYC. ↑ Disney may have named his cartoon for this movie. The wind scene was reprieved and cameoed in The Witches of Eastwick. It also contains the deadly falling-wall gag. ↑ "Sherlock Holmes" moviediva. Retrieved April 16, 2008. ↑ Andrew Sarris, The American Cinema: Directors and Directions, 1929-1968 (New York: Da Capo Press, 1996, ISBN 0306807343). ↑ Greatest Film Directors and Their Best Films: Part 2 filmsite. Retrieved March 12, 2011. ↑ Greatest Film Directors and Their Best Films: Introduction filmsite Retrieved March 12, 2011. All links retrieved December 22, 2016. This page was last modified on 22 December 2016, at 16:14.